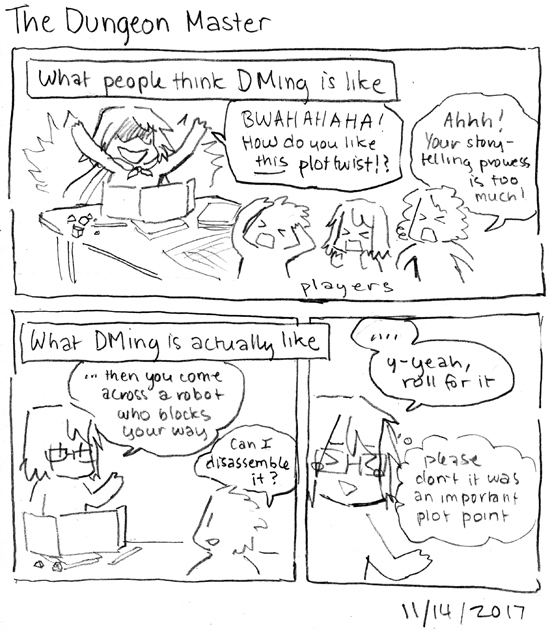 I started DMing a Dungeons and Dragons game for some friends a while back! It’s super, super hard but it’s really rewarding and fun! Even though my plans don’t always work out, it’s fun to see how players react to the things that DO work out and to see what happens when we go off the rails. HAHA yes, that’s definitely the hard part! Ah, yes, the glorious realm of D&D! I run a game for a group that includes a Halfling Rogue, a Dragonborn Monk, an Elven Druid, a Warforged Barbarian, and an Elven Ranger. Many shenanigans have happened, such as our Rogue using the Druid (wild-shaped into a gianter-than-normal giant toad thanks to a potion of growth) as mobile cover, our Barbarian deciding to pick Human as their totem spirit (they follow Aasimov’s three laws of robotics — long story), and our Ranger deciding to ask out a drow lady the group ran into (she’s actually a doppelganger, but they haven’t figured that out yet). I should schedule another session sometime soon — we’ve been having a break because we just finished the Starter Set and I’ve had to start devising my own adventures. Sounds like you’ve been having some pretty awesome adventures already! I’m at about the same stage too, I started out with a pre-written adventure but I’m going to have to start writing my own.